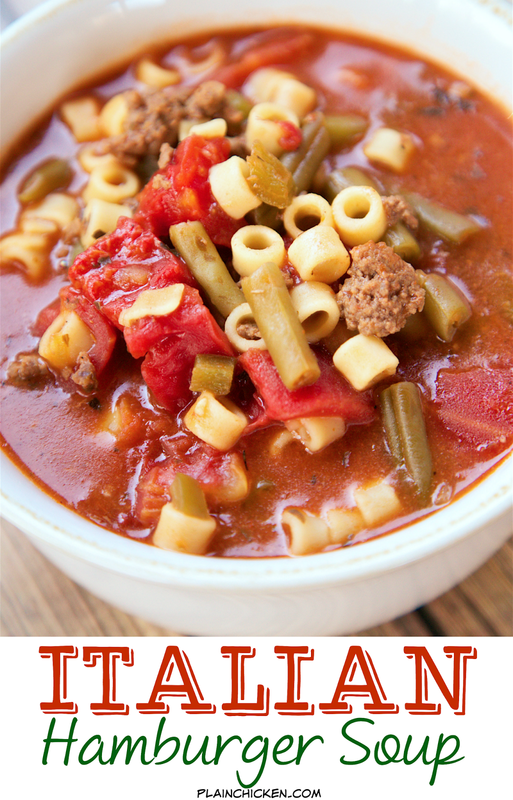 Italian Hamburger Soup - ground beef, peppers, stewed tomatoes, green beans, tomato sauce, oregano, basil and pasta - SO good! We ate this two days in a row. Makes a ton - freezes well. 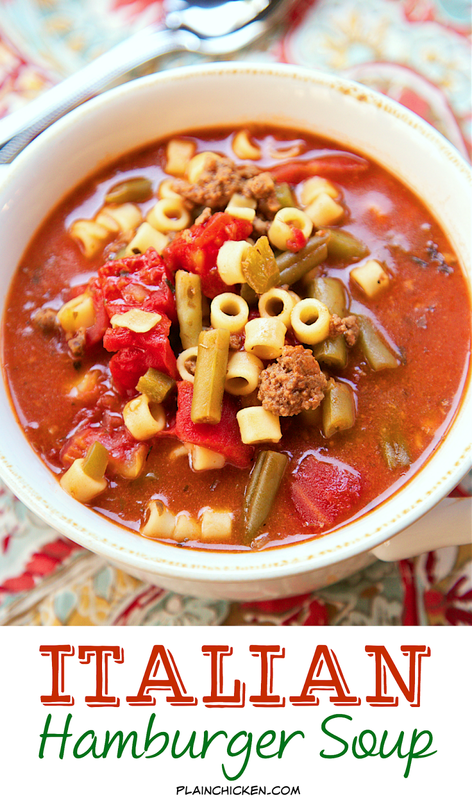 We are big soup fans, especially this time of year. We love to eat soup for lunch and dinner. 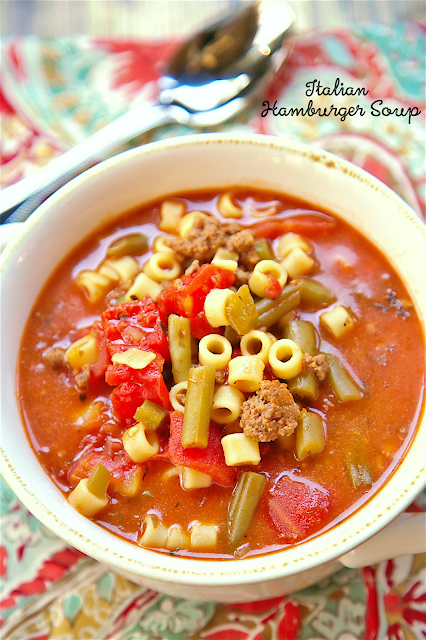 This Italian Hamburger Soup was crazy good. It was super simple to make and smelled AMAZING while it was cooking. I made this on the stove and it took about 30 minutes. You could certainly make this in the slow cooker. If you do make it in the slow cooker, don't add the pasta until about 20 minutes before you are ready to serve it. This makes a ton of soup. We ate it for dinner and lunch the next day. We portioned out the rest of the soup into plastic containers and froze it for later. I love being able to grab a container for a super quick weekday/weeknight meal! In a Dutch oven, cook the beef, onion and bell pepper over medium heat until meat is no longer pink. Add garlic and cook 30 seconds. Drain fat. Stir in remaining ingredients. Bring to a boil. Reduce heat and simmer for 20 to 30 minutes. I've been on a soup kick! I need to add this to my rotation! We are having this for dinner tonight, but I am going to use ground turkey instead. 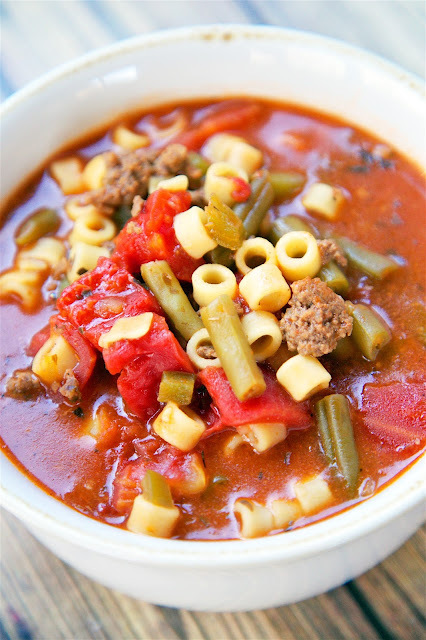 Perfect weather for a good hearty soup! I made this for a potluck at work. I used venison instead of hamburger meat and I could not find the pasta that you used so I used spiral pasta. It was a hit! Several people asked for the recipe. I cooked it on the stove before work and then let it simmer in the crockpot until lunch time in my classroom.